We’re starting the week off with a sort of Kickstarter-ish bit of info for you—that includes a cool challenge. Jason Tagmire, designer of the eagerly anticipated Pixel Lincoln card game, has designed a Pixel Lincoln Bicycle deck (which is currently in the midst of a Kickstarter campaign), and has also issued a challenge to YOU. They’re looking for some folks to design a game around the theme of the deck—could be a trick-taking game, set, building, solitaire anything. You may have always thought, “Hey, it would be cool to design my own card game.” Well this is your chance to get your feet wet. And then dry them off and design a game. There’s a whole lot more information over on the Kickstarter page for the campaign; you can follow this link for the details! Thanks for reading, and we appreciate all the social media love! Look us up on Facebook and Twitter! Here’s a look at the spiffy deck! Last week, game designer Ben Rosset took a few minutes to answer all the burning questions we had about himself, his new game Mars Needs Mechanics, and the meaning of life. How did you become interested in designing board games? My goal was to make an easy to learn Economics game where players could only indirectly control the market price of goods, and where players would have to predict the behavior of everyone else in order to be successful. That led to the “Sales Order Line,” the driving force behind Mars Needs Mechanics. It’s a unique timing mechanism for controlling the price of the game’s components (Boilers, Wire, Lenses, Piping, etc), and it’s what makes the game hum. People really love it. Its something new, and it’s a very simple system. So, the Berkeley Breathed book and subsequent Disney film Mars Needs Moms didn’t come into play? Or are you tired of being asked that? No, Mars Needs Moms didn’t come into play. To be honest, I didn’t even know about that film (which I hear was a flop) before I named the game Mars Needs Mechanics. However, I did know about the 1967 film Mars Needs Women. It was more a play on that than the Disney film. And yes, people ask me this question a lot, but its ok…we invited the question when we decided on the name. If anything, its helped to spark a bit of interest in the game. What are the top 5 games you’re playing right now, and why? With all the time we’ve been spending with Mars Needs Mechanics, I haven’t had much time to play other games. So I’ll give you three. First, I’m playing States: After the Fall. It’s an unpublished game by Mike Swiryn, Aaron Winkler, and David Golanty. I won’t give too much away about the game, but I know it’s received tremendous feedback from publishers at conventions, and I suspect it will get picked up by a publisher very soon. After that, I’ll say For Sale, by Stefan Dorra. This is a game that has been on my list to try for quite a while, and I finally did a couple weeks ago. Short, simple, and addictive, I loved it right away. Third, Agricola is always on my list. Its still my favorite Euro game, and it’s hard to imagine it ever getting knocked out of my top 5! Other than “42,” what is the meaning of life, the universe, and everything? Mars Needs Mechanics launches a Kickstarter campaign on midnight Aug. 31! As soon as we have a link, we’ll post it here for you! 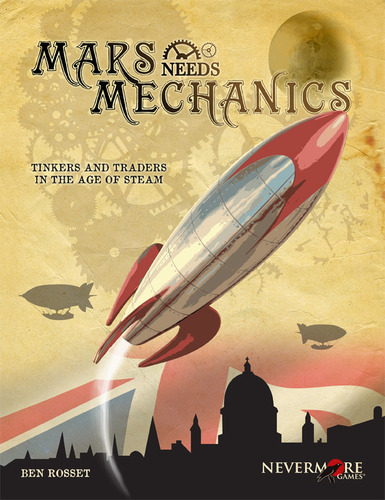 But for now, click here if you want to check out Mars Needs Mechanics!